Some beginning winemakers may already have some equipment or want to pick and choose each component. 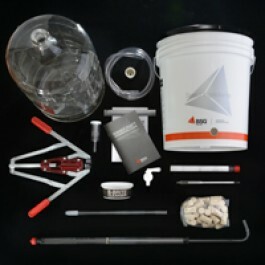 But for the newcomer that wants a complete set of equipment in a single box, BSG HandCraft offers the K5 Wine Equipment Kit. It includes all the conveniences you get with the K2 kit, like an automatic pump-style siphon, and a full 32-page beginner’s guide. But the K5 also has a Portuguese Double-lever Corker, and a 30-count bag of Neutrocork® natural cork closures.